As from 1st October 2015 new regulations came into force which affect the no-fault section 21 eviction rules, they bring in new measures to prevent landlords evicting tenants simply because they complain about repair issues, they bring new requirements to provide information for tenants, and they add extra safety rules for lettings such as mandatory smoke and carbon monoxide alarms. These rules apply primarily to England and although other jurisdictions may be similar, there may be important differences. 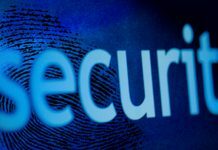 Because of the seriousness of these matters, when defaults can result in heavy fines, and in some cases criminal records and imprisonment, it is important that if you are unsure about these issues you should seek professional advice. The [section 21] form should be used where a no fault possession of accommodation let under an assured shorthold tenancy (AST) is sought under section 21(1) or (4) of the Housing Act 1988. The form must be used for all ASTs created on or after 1 October 2015 except for statutory periodic tenancies which have come into being on or after 1 October 2015 at the end of fixed term ASTs created before 1 October 2015. The validity period of the form is six months following the date of its issue unless the tenancy is a periodic tenancy under which more than two months’ notice is required, in which case the validity period is four months from the date the tenant is required to leave (see notes accompanying the form). where the landlord has not provided the prescribed information and/or prescribed documents as set out below; where the landlord has not complied with the tenancy deposit protection legislation; or where a property requires a licence but is unlicensed. We recommend that this should be given at the start of the tenancy. Landlords are not required to supply a further copy of the publication each time a different version is published during the tenancy. Where the landlord has failed to provide the publication, this form [New s21] may not be used. However, this restriction is lifted as soon as the publication has been provided. The requirement does not apply where a landlord is a private registered provider of social housing or where a landlord has already provided the tenant with an up-to-date version of the booklet under an earlier tenancy. If the tenant has not notified the landlord, or a person acting on behalf of the landlord, of an e-mail address at which the tenant is content to accept service of notices and other documents given under or in connection with the tenancy, the landlord must provide a paper copy of the publication. Tenants that need advice about this notice, and what to do about it, should take it immediately to a citizens’ advice bureau, a housing advice centre, a law centre or a solicitor. Tenants can also get expert, independent advice free from Shelterline on 0808 800 4444. Their advisers will be able to give expert advice, independent advice. The Government supports a bigger, better and more professional private rented sector. Tenants can expect to receive good quality accommodation, and to have necessary repairs carried out within a reasonable time. 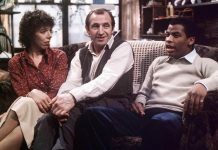 Although the quality of privately rented housing has improved rapidly over the past decade, with surveys showing that 84% of private renters are satisfied with their accommodation, there is still a small number of rogue or criminal landlords who knowingly rent out unsafe and substandard accommodation. We have already taken steps to drive out bad landlords from the sector. For example, we made available £6.7 million to a number of local authorities to tackle acute problems with rogue landlords in their area. This resulted in nearly 40,000 property inspections, and over 3,000 landlords facing further enforcement action or prosecution. In addition, we have introduced measures to ensure fairness for landlords, making the eviction process more straightforward in appropriate circumstances. We have introduced protections for tenants against “retaliatory eviction” where they have a legitimate complaint about the condition of their property. We have also made it a requirement that landlords provide all new tenants with more information about their rights and responsibilities as tenants. These protections will come into effect on 1 October 2015 and this is what this guidance note is about. 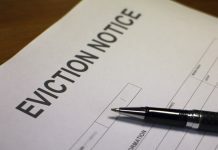 Retaliatory eviction is where a tenant makes a legitimate complaint to their landlord about the condition of their property and, in response, instead of making the repair, their landlord serves them with an eviction notice. Retaliatory eviction is an unacceptable practice and no tenant should fear becoming homeless because they have asked for a necessary repair. What do we mean by a tenancy? A tenancy is an agreement between a landlord and a tenant. It is a contract that allows each of them certain rights, and also requires them to fulfil certain responsibilities. For example, it allows the tenant the right to live in the property, and the landlord the right to receive rent in return. Nowadays, almost all tenancies in private rented accommodation are known as assured shorthold tenancies. These usually last for 6 or 12 months, although if the landlord and tenant agree, they can be for longer. When we talk about a tenancy in this guidance note, we are referring to this common type of tenancy. What tenancies do these new rules apply to? These rules, set out in the Deregulation Act 2015, apply to all new assured shorthold tenancies that start on or after 1 October 2015. In practice, this means that they will apply to almost all tenancies entered into with a private landlord on or after this date. What is changing on 1 October 2015? On 1 October 2015 a number of provisions in the Deregulation Act 2015 will come into force. This means that it will be a legal requirement to follow them. These provisions are designed to protect tenants against unfair eviction. Where a tenant makes a genuine complaint about the condition of their property that has not been addressed by their landlord, their complaint has been verified by a local authority inspection, and the local authority has served either an improvement notice or a notice of emergency remedial action, a landlord cannot evict that tenant for 6 months using the “no-fault” eviction procedure (a section 21 eviction). 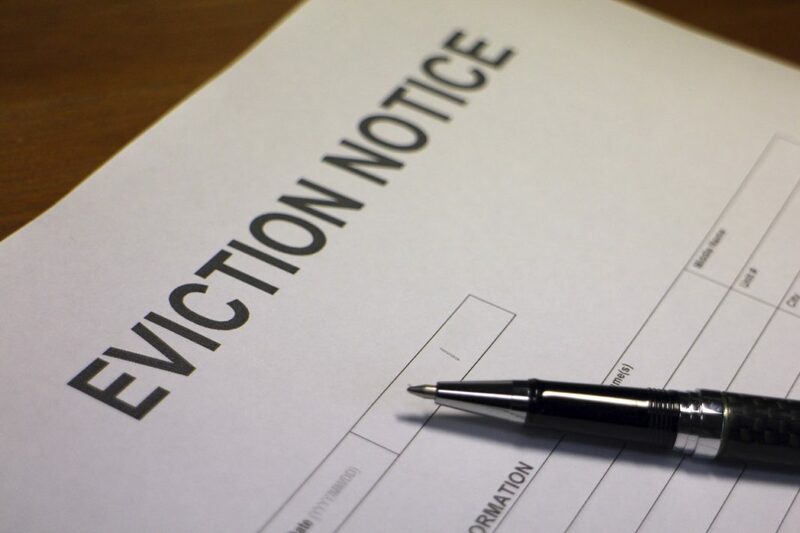 A ‘no fault’ eviction is one where the tenant does not have to have done anything wrong, for example not paying the rent, to be asked to leave. The landlord is also required to ensure that the repairs are completed. The process the tenant should go through is set out in more detail below. 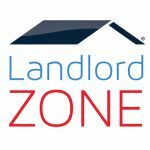 The changes introduced by the Deregulation Act 2015 also make it more straightforward for landlords to evict a tenant where they are allowed to do so. We have introduced a new form that landlords must use when they are relying on a section 21 eviction. There are some additional new rules, particularly around the information which must beprovided to tenants before landlords can serve the new section 21 form, which are set out in this note. What kinds of repairs are covered by this legislation? These new rules allow tenants greater security than before. They allow tenants to make reasonable complaints about the property they are living in to their landlord without fear that they will be evicted as a result. The kind of complaints to which these rules apply concern a serious issue that might cause a potential risk of harm to the health or safety of the tenant, or a family member. The sort of repair that would not be covered by these rules is a dripping tap, or changing a lightbulb. The vast majority of landlords will address these sorts of serious issues quickly. This legislation is targeted at those who not only fail to make these repairs, but then attempt to evict the tenant in response to their complaint. This guidance note is not intended as a substitute for legal advice. If you are unsure about any of these new rights and responsibilities, you should contact your Local Citizens Advice office, call Shelter’s helpline on 0808 800 4444, or speak to a solicitor. In addition to reading this guidance note, landlords may wish to approach a landlord group for advice on these new measures. What information must a landlord provide for a new tenancy which begins on or after 1 October 2015? At the start of a new tenancy, the landlord should provide a tenant with certain documents. A valid Energy Performance Certificate. An Energy Performance Certificate (EPC) contains information about how much it will costs to heat the property. It also offers recommendations about how to reduce energy costs and save money. A valid annual Gas Safety Certificate. A Gas Safety Certificate is proof that the gas appliance has been checked by a Gas Safe registered engineer. Each gas appliance must be checked and certified each year. 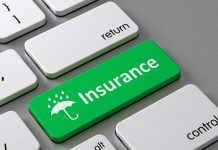 The landlord is still required to provide mandatory information required by other legislation, including relevant tenancy deposit protection information. What if a landlord does not provide these documents at the start of a tenancy? The landlord should supply these documents at the start of each new tenancy. If they are not supplied at the start of the tenancy, they should be supplied as soon as possible thereafter. 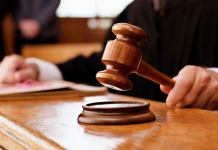 If these documents have not been supplied, the landlord cannot serve a section 21 notice. As soon as the landlord supplies these documents this restriction is removed. 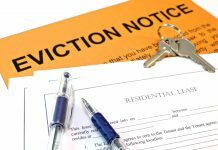 We have introduced a new standard form for section 21 eviction notices – what does this mean for landlords? In order to use this form the landlord must have provided the mandatory information that is set out above. The landlord must also have complied with the tenancy deposit protection legislation. How long do I have to respond to a tenant’s complaint about the property? Landlords have 14 days from the date of the tenant’s complaint to make a response. Their response should set out what they intend to do to remedy the problem and include a reasonable timeframe for carrying out the works. The landlord should then make arrangements to carry out the repair. In the vast majority of cases this will be the end of the matter. The full complaint process is set out below [figure 1]. 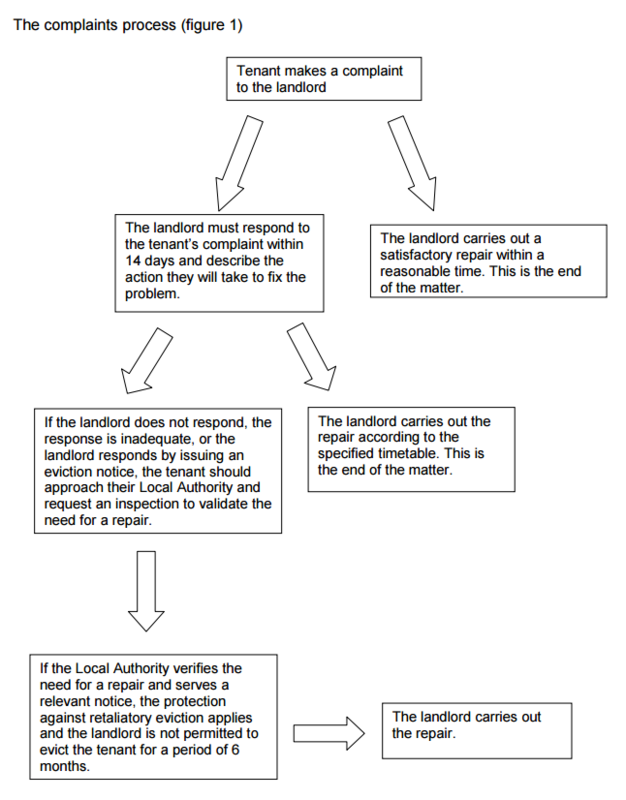 What process must a tenant follow when reporting a complaint? If, after 14 days from the tenant making a complaint, the landlord does not reply, that reply is inadequate, or they respond by issuing a section 21 eviction notice, the tenant should approach their local authority and ask them to step in and carry out an inspection to verify the need for a repair. The Local Authority will arrange to inspect the property. They will conduct a thorough check. 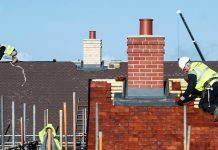 There is a detailed assessment method (known as the Housing Health and Safety Rating System) that has been developed to help Local Authorities verify whether a property contains serious health or safety hazards. If the inspection verifies the tenant’s complaint, the inspector will take appropriate action. There are a number of enforcements options open to Local Authorities, including Improvement Notices and Notices of Emergency Remedial Action, but they will almost always engage with the landlord first, in order to try and resolve the problem informally. 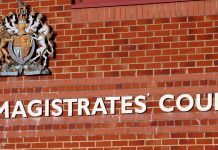 If the local authority serves an Improvement Notice or Notice of Emergency Remedial Action, the landlord cannot evict the tenant for 6 months using the no-fault eviction procedure. 2 These provisions do not apply where a statutory periodic tenancy arises on or after 1st Oct 2015, on the coming to an end of a fixed term tenancy which was entered into before 1st Oct 2015. 5 Where there is no relevant gas appliance in any room occupied or to be occupied by the tenant, the landlord may instead display the Gas Safety Certificate in a prominent position in the property. This display should include a statement that the tenant is entitled to have their own copy of the Gas Safety Certificate if requested. 6 Except for where a statutory periodic tenancy arises on or after 1 October 2015, on the coming to an end of fixed term tenancy which was entered into before 1 October 2015. 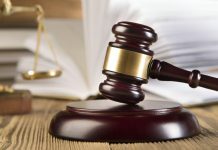 7 In the case of a renewed tenancy, the four month period is calculated by reference to the start of the original tenancy and not the start of the replacement tenancy – see section 21(4B) of the Housing Act 1988. 8 Unless the tenancy is a periodic tenancy under which more than two months’ notice is required (see the notes accompanying the section 21 form). 9 Where the local authority has served an improvement notice or notice of emergency remedial action, the tenant is protected from eviction for 6 months from the date of service of that notice, regardless of whether they raise the issue with the landlord first. 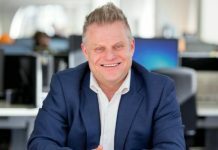 Where tenants are seeking to have a s.21 notice that has already been served to be found invalid, they need to have raised the complaint with the landlord first.